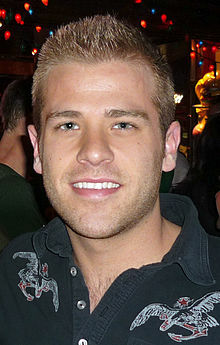 Scott Evans (born September 21, 1983) is an American actor. He is best known for playing the role of police officer Oliver Fish on the ABC daytime soap opera One Life to Live. He is the younger brother of actor Chris Evans. Evans began playing the recurring role of police officer Oliver Fish on One Life to Live on January 15, 2008. He subsequently appeared briefly on Guiding Light as Trey in 2008, and guest-starred as Woody Sage in the June 22, 2008 Law and Order: Criminal Intent episode "Betrayed" as well as the role of Ben in the October 21, 2008 Fringe episode "The Cure." Evans was also seen as Chad the Mail Clerk in the 2009 film Confessions of a Shopaholic. Initially brought in to One Life to Live for five episodes, Evans returned for a total of 137 episodes. In July 2009, his character Oliver Fish became involved in a romantic relationship with another man named Kyle Lewis (played by Brett Claywell). The storyline came to wider attention when Patricia Mauceri, an actress who had played a recurring role on the One Life to Live since 1995, was replaced after reportedly voicing personal religious objections to her character's involvement in his storyline. The Fish storyline on One Life to Live was dropped and both Scott and Brett were let go in 2010. Scott also had a guest role on the AMC series Rubicon as an American involved in a serious terrorist attack with al-Qaeda. Raised in Sudbury, Massachusetts, Evans is the son of Bob Evans, a dentist, and Lisa (née Capuano) Evans, a dancer and later artistic director at the Concord Youth Theater. He has two sisters, Carly and Shanna, and an older brother, actor Chris Evans. Scott Evans studied theatre at New York University. He is openly gay. He came out at age 19. 2008 Law & Order: Criminal Intent Woody Sage (Scott Woodley) Episode: "Betrayed"
Fringe Ben Episode: "The Cure"
2010 Law & Order Thomas Moran Episode: "Steel-Eyed Death"
Rubicon Joe Purcell Episode: "Wayward Sons"
2011 Law & Order: Criminal Intent Shane Berlin Episode: "Trophy Wine"
2014 Looking Cody Heller Episode: "Looking for a Plus-One"
Hit the Floor Danny Episode: "Unguarded"
^ a b Krebs, Sean (December 14, 2009). "Behind The Scenes: The Scott Evans Cover Shoot". Instinct. Archived from the original on July 26, 2011. Retrieved December 16, 2009. ^ a b c d e Jensen, Michael (June 15, 2009). "Exclusive: Scott Evans' First Interview". AfterElton.com. Retrieved July 21, 2009. ^ a b Voss, Brandon (February 2009). "A List: Chris Evans". The Advocate. Issue #1023. Advocate.com. Retrieved July 21, 2009. ^ "One Life to Live recap (1/15/08)". Soaps.com. Retrieved March 7, 2010. ^ Marotta, Terry (July 19, 2007). "Grease is the word". Gatehouse News Service via Wicked Local Sudbury. Archived from the original on April 3, 2014. Retrieved July 19, 2010. ^ Chris Evans Outed Bro Scott, advocate.com, December 30, 2009. ^ Whalen, Natalie (22 Nov 2016). "Chris Evans' Gay Brother Helped Him Understand LGBT Issues". Out. Retrieved November 24, 2016. ^ "Scott Evans' Brother Chris Was the One Who Outed Him. Not That He Cared". Queerty. December 31, 2009. Retrieved November 24, 2016. This page was last edited on 9 March 2019, at 23:44 (UTC).